Muis introduces flanged heavy duty sight flow indicators. They come in carbon steel, stainless steel, PTFE lined and other special metals, featuring high pressure and extreme service options. Flanged sizes range from ½” to 12″. 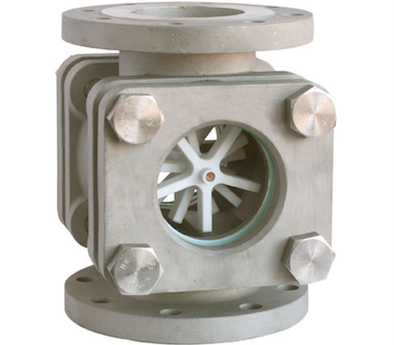 Flanged units are available in four styles designed to accommodate various mounting positions, fluid characteristics, flow rates and directions. Plain Style: May be installed in any position to observe fluid flow in any direction. These style indicators are usually employed to detect either the presence or absence of solutions, or to observe fluids for turbulence, colour or clarity. Drip Tube Style: This style is well suited for vertical lines with downward flow direction. These units are particularly recommended for applications characterized by low or intermittent flow rates, such as distillation processes. Flapper Style: Recommended for monitoring either horizontal or vertical lines with upward flow. The flapper position indicates current flow rate. Flapper style indicators are the appropriate choice for use with clear and semi-opaque solutions. Rotator Style: This style indicator may be installed in any position to indicate flow in any direction. The visibility or rotor motion makes this style particularly well suited for monitoring clear, translucent or dark solutions.